The SMS chatbot officially titled Send Me SFMOMA works similar to sending a text message to a friend. The chat bot will text art directly to you once you send a request. SFMOMA is a genuine project and is a decidedly modern method of accessing art and sharing art with the public. In recent weeks, the SMS chatbot has become a viral success. Anyone can use it. SMS chaos SFMOMA works in a very simple manner. All you have to do is send a text message to San Francisco Museum of Modern Art using a keyword and the name of an emoji or a color. 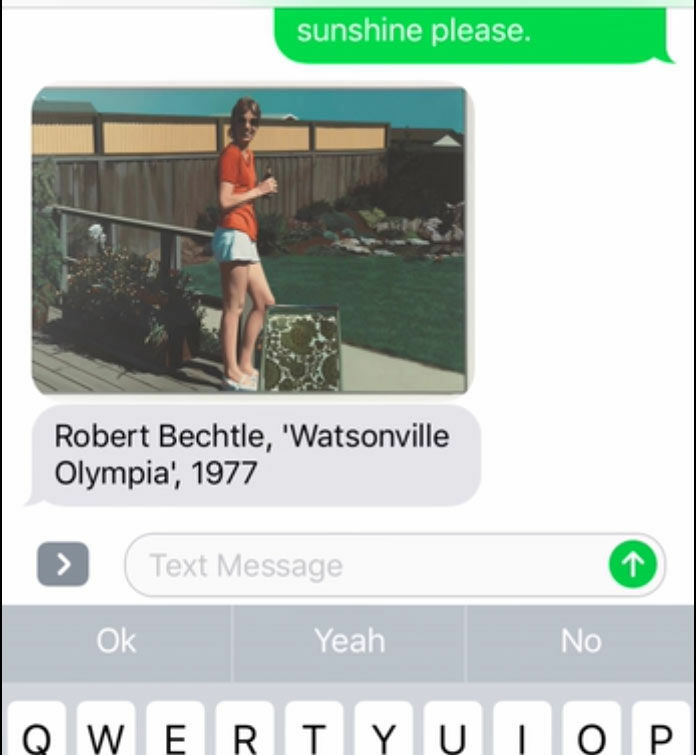 The SMS chatbot runs through a database and matches your search to the tags that SFMOMA’s staff has attached to the art. The database covers about half of the SFMOMA art collection so you will always find what you are looking for. SFMOMA is an SMS chatbot service that provides a creative, approachable and personal method of sharing the breadth of SFMOMA’s collection with everyone. It is designed to generate the museum art pieces to as many people as possible in a world oversaturates with information. However, the SMS chatbot does work if you send anything. It is meant to send you only art you don’t know about. For example, if you send an artist name, it will not reply with an art, instead, it will tell you to be more creative, because you already know the art or artist. It only sends the art you know nothing about. You also can’t send, ‘send me naked people,’ they are not going to send you any pictures of naked people. That means if you text the words “send me blue” you could get an Eponge by Yves Klein or “send me the ocean” it might send you Breaking wave, Golden Gate by Pirkle Jones. The words to use is ‘send me” plus a keyword, emoji or a color and you will receive a related artwork image in return, it is the best SMS chatbot so far. The word ‘Send Me’ are sent to 572-51. The service is an attempt by the museum to make their more than 34,650 pieces of art accessible to as many people as possible rather than the 5% you see on their display at any given time you visit the museum. The SMS chatbot works well with mobile phones. According to Keir Winesmith, head of web and digital platforms at SFMOMA, they found the computer version didn’t return exciting results. “The intuition and humanness of the way staff tag versus the linearity of the computer vision approach make people miss out on the sublimes,” said Winesmith. Send me was conceived as a way of bringing transparency to the public while engendering further discussion and exploration among users. It is an SMS chatbot service that offers creative slumps a way of getting them back in the groove. After the pilot run in May, the staffer found a need to change their tagging for the project to make it successful. According to Winesmith, people were asking for subjective things that traditionally wouldn’t tag any of SFMOMA art collection. That’s why they needed to change it and make it user-friendly. Whether or not the SFMOMA SMS chatbot serves as one of the highlights of a little-known gem and the museum art collection, it is making art go viral.